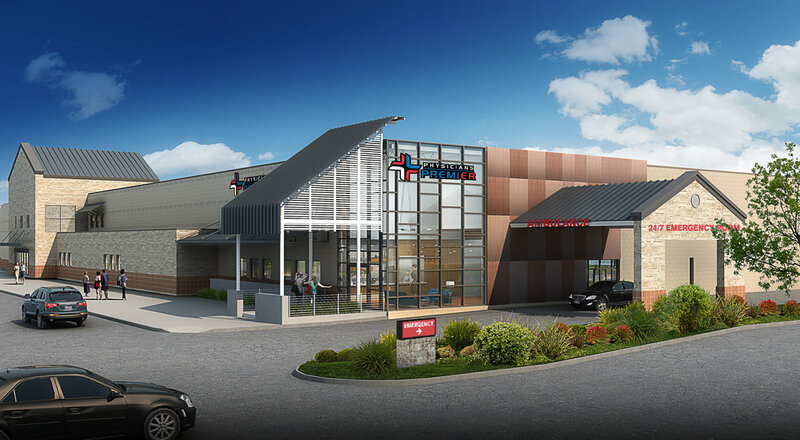 A growing community in the Hill County of Central Texas is home to the newest iteration of Physicians Premier. Addressing the health needs for an underserved populace of families and empty-nesters, the new facility fills a void in the area’s social infrastructure. Rather than build entirely new, the client adaptively re-used an unremarkable and defunct but highly visible commercial center overlooking Bulverde’s busiest thoroughfare, thereby providing an urgent need while improving the community streetscape. Contextual materials were selected to leverage the expertise of local trades through the use of wood, steel, and glass crafted with modern detailing. A steel frame canopy shelters a main entrance and lobby that is carved-out from the corner facing the street alongside a new exterior steel skin graphed onto the existing blank facade. Interior finishes and lighting were curated for a warm and familiar atmosphere without resorting to regionalist cliché. Necessary upgrades were made to bring the building beyond current energy standards and in line with user goals. A portion of the programmed space is set aside as a regional operations hub for this young and rapidly expanding enterprise. An intricate and complex program coupled with a heavily regulated facility type make for a project that is both rigorous in execution and efficient in its operation.